The US immigration bill, which is awaiting passage by the Senate, will reduce the American budgetary deficit by $175 billion in 10 years, an independent Congressional report has said. The Congressional Budget Office, in its report, said the bill, if passed by the Congress in its present form and signed into a law, will save $197 billion in 10 years. The report subtracts implementation cost of the bill, which is expected to stand around $22 billion. The bill, the CBO report says, will decrease the deficit by an additional $700 billion in another ten years. 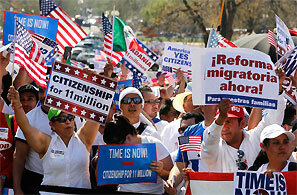 "This report is a huge momentum boost for immigration reforms. This debunks the idea that immigration reform is anything other than a boon to our economy, and robs the bill's opponents of one of their last remaining arguments," said Senator Chuck Schumer. "We have more proof that bipartisan commonsense immigration reform will be good for economic growth and deficit reduction, this time in the form of a nonpartisan Congressional Budget Office estimate," White House Press Secretary, Jay Carney, said in a statement. The CBO estimates come close on the heels of a recent analysis by the independent Social Security Administration's Chief Actuary last month that the immigration bill will strengthen the long-term solvency of social security for future generations, Carney noted. "The Congressional Budget Office also made clear that passage of the bill would not only reduce the deficit, it would increase economic growth for years to come. By fixing our broken immigration system - and making sure that every worker in America is playing by the same set of rules and paying taxes like everyone else - we can grow the economy, strengthen middle class, improve our fiscal outlook and create new opportunity for Americans everywhere," he said. "The bipartisan immigration reform legislation before the Senate will spur economy and reduce our deficit, and CBO's positive report is a green light to passage if Senators really believe in deficit reduction," said Senator Patrick Leahy, chairman of the Senate Judiciary Committee. Republican Senator Marco Rubio said the CBO has further confirmed what most conservative economists have found, that reforming the immigration system is a net benefit for economy, American workers and taxpayers. "There remain some key areas that need to be tightened up to prevent those who have violated our immigration laws from accessing federal benefit programs. But overall, the CBO report offers encouraging evidence that the status quo is unacceptable and we can end it without burdening our already burdened taxpayers and, in fact, reduce the deficit over the next 20 years," Rubio said.